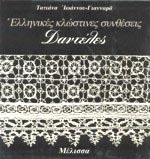 An instructive and well-documented source material, colour and black-and-white photographs and typical examples of threadwork in museums and private collections in Greece, are presented here in full recognition of their importance to the international bibliography. Special supplementary designs and patterns analyse the methods used, to make it easier both to comprehend and to reproduce traditional threadwork as well as to create new patterns. 54 colour and 155 b/w photographs and drawings.